In November 2014, the Apple of China, Xiaomi launched its first game changer phablet-the 5.5-inch Redmi Note for a mere Rs 9,999. Since then the brand had not looked back and kept on launching better versions at cost effective prices, much to the delight of the smartphone users. 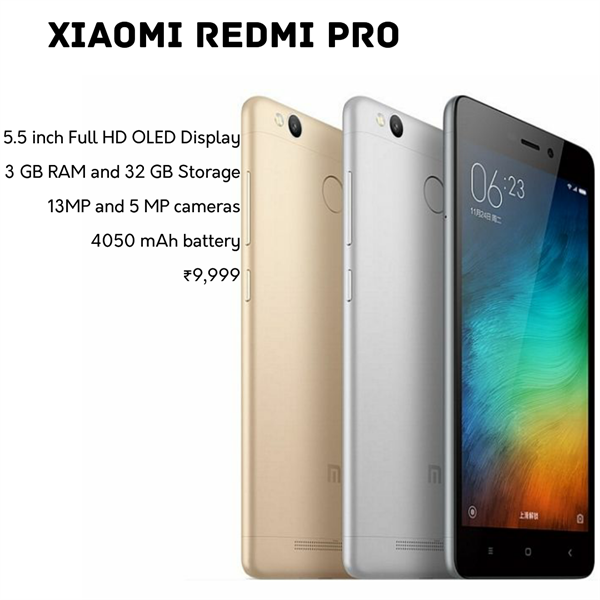 In July 2016, it announced of releasing yet another model in the month of August of the same year-The Xiaomi Redmi Pro. It is already creating quite a flutter as being the first affordable smartphone with dual cameras! Thus we present below some of its specifications to get the vibe of the device. The device comes wrapped in a brushed aluminum metal body with 2.5 curved glasses covering the 5.5-inch full HD OLED display. The unit promises to look as well as feel terrific in the hands. In contrast to the normal IPS LCD screen, the new OLED display with 100% NTSC color gamut and super high contrast ratio at 1080 x 1920 pixels, promises you pretty vivid and bright images which will enhance the viewing experience. Be it videos or simple browsing; expect the fun quotient to amp up. All components are placed as in previous brand's models except the fingerprint sensor which has moved in the front arena from the back and embedded itself straight into the home button below the display. This facilitates the dual camera set up in the back. The device is powered by the latest MTK Helio X20 64 bit deca-core processor running at a speed of 2.1 GHz. Its tri-cluster architecture promises to improve its power efficiency by 30 percent, which should make highly intensive tasks seem light. With its promised high performance, 3GB of RAM and 32GB of internal storage and the latest MIUI 8 OS, based on the Android 6.0.1 Marshmallow, the unit is attracting positive vibes. Its 4,050 mAh huge capacity non removable battery again teases you of being heavy duty with terrific life. Features like dual SIM, external memory expansion capability of up to 256 GB MicroSD make the deal all the more sweeter! Its hallmark feature, the dual camera consists of a 13MP camera with Sony IMX 250 sensors to capture still images and a 5MP Samsung camera to capture depth information. Photos should be amazing! Packed with a loudspeaker to amplify music tones and playback, its sound system should make for terrific music through the radio or stored music! Capability of watching videos up to nine hours with terrific audio and visual systems might just be the ultimate! Going to be available in silver, gold and gray at a deal clinching price of just $259, the unit looks guaranteed to be a big hit! A beast in terms of its raw processing power, top of the line chipsets, awesome hardware, latest software, dual cameras with great looks and battery life—is it any wonder why the brand sells like hot cake! The unit looks like a deadly flagship smartphone without the exorbitant price it normally tags! The unit is definitely worth checking into and giving a try!